So, yesterday, we dropped the two big guys off to volunteer at the bookmobile for the Summer Reading Program, and I took the rest to Focus on the Family. They were holding a Freedom Fair. Oh, I wish we could have stayed longer. We got in line to meet a certain someone, and when it was our turn, Trina got scared. Richard marched past her, stuck out his hand, and said "It's an honor to meet you, Mr. President Lincoln." You can see him shaking hands with "the president" on the left. Lincoln asked Richard is he knew who the guy was off to Richard's right, and Richard just said "Yep." And then Richard marched over and shook his hand (I didn't get a picture) and said, "It is an honor to meet you too, Mr. General Robert E. Lee." Thomas shook hands with the president, and Trina finally got up the nerve to approach him too. Too scared to shake his hand though. 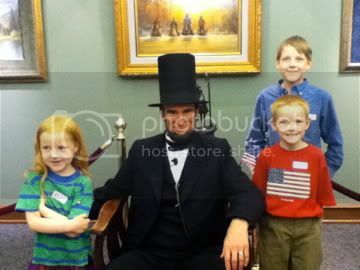 Richard has totally idolized Mr. Lincoln ever since we did Sonlight Core 4... when Richard was four years old. He used to be able to relate all kinds of stories about Lincoln. Clearly, he has forgotten some of them now though. 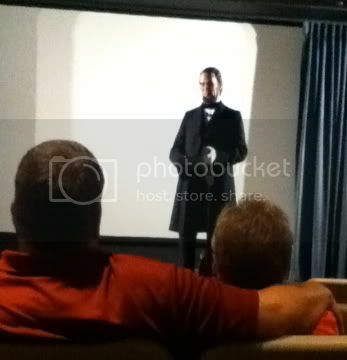 We then had the chance to go see President Lincoln speak. Wow. Presented by a group called HIStory Righters, this was fabulous. A Mr. Williams started things off, talking about freedom, and about how Lincoln in signing the Emancipation Proclamation made it so that his granddaddy would be the first man in the Williams family born free. Lincoln was escorted to the front, and told the story starting February 11, 1861, with him leaving Illinois to make his was to Washington City to be innaugurated. He recited some of the speeches he made along the way, and told the story of the little girl in New York who had written to him to suggest he grow whiskers. 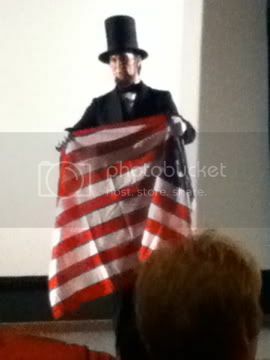 Lincoln went through the trip up the innauguration, and he recited a paragraph from that speech. He talked some about the war, and the losses, and especially about the Emancipation Proclamation. Gettysburg, and the Gettysburg Address, of course, were also part of the presentation. Lincoln talked about how The Battle Hymn of the Republic came to be, including some details I either didn't know, or had forgotten. A woman in period costume whose name I've totally forgotten sang it, having audience members join in on the chorus. I was pleased to see my kids singing, though Trina seemed to be making up the words as she went. What a great day though. Wish we could have stayed longer and looked over more of the display materials. And it would really have been nice to have checked out some of the sale items at the bookstore. Ah, well. The one thing they had on sale that I knew about --- all the Drive Thru History America volumes -- we already own! It sounds like a really great event! 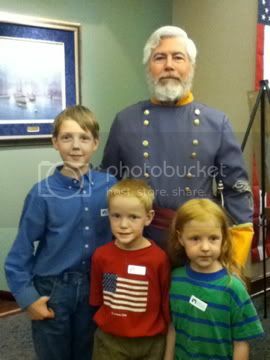 We had such a great time meeting Lincoln at a Civil War Days in our area some time ago. 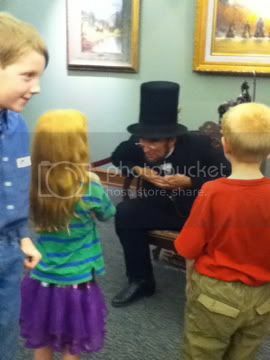 What a thrill kids get from meeting a historical figure! I think these events are awesome and I am contemplating using Drive Thru History myself, it seems really great. Glad to know someone else who has used it and likes it. Thanks for sharing and have a happy 4th! What a cool opportunity! 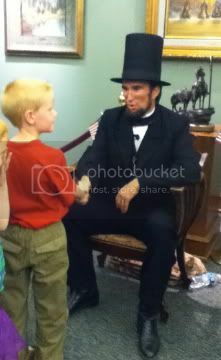 My Justin would have loved meeting Mr. Lincoln! He loves the Presidents and Lincoln is one of his favorites! What a neat event! Your son is so cute! I'm sure he'll remember this day for a long time.